Icons / Search Final Created with Sketch. Cross Symbol Created with Sketch. Strategies for Mitigating Climate Change in Agriculture*, a California Environmental Associates and Climate Focus authored report, finds that annual carbon emissions from global agriculture can be reduced by as much as 50 to 90 percent by 2030. The study highlights key strategies – led by reduced global beef consumption, reduced food waste, and better farm nutrient management and production – that can deliver big climate wins while maintaining food security and building resilience. 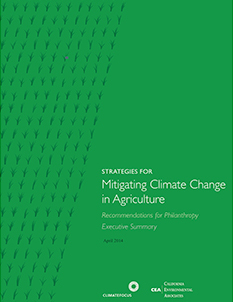 * “Strategies for Mitigating Climate Change in Agriculture” is an abridged version of “Strategies for Mitigating Climate Change in Agriculture: Recommendations for Philanthropy,” which the Climate and Land Use Alliance commissioned to help philanthropic organizations identify opportunities to reduce greenhouse gas emissions in the agricultural sector. The full report includes recommendations for interventions and a technical annex.